Use water sport shoes or no shoes for SUP? Should you wear water sport shoes or deck shoes, or go au naturel? Bottom line, it’s going to be a personal preference, and the style of paddling you choose will play a role in where you put your toes. The serious surfer, racer, or freestyle SUPer might claim that to be one with the board, barefoot is the only way to go. On the other hand, casual paddlers can be seen both with and without shoes. Let’s look at the pros and cons. 1. If the plan is to ride down a lazy river where rocks and other objects lie below the water, or if you’ll be cruising the ocean where a bed of oysters may be hiding, shoes make sense. This is especially true while getting in and out or off and on your board. 2.	there are some who are simply not comfortable barefoot or for whom foot support is needed in general. 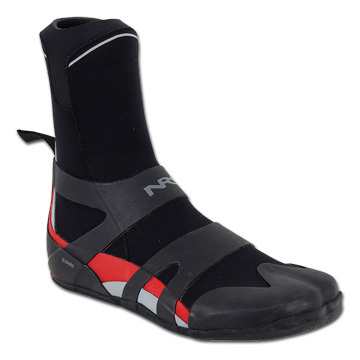 3.	cold weather paddlers need some type of neoprene shoe or bootie. This is a must to protect from cool temperatures. 1. Many flat water paddlers, cross trainers, serious racers, and yoga enthusiasts prefer bare feet. Stand up paddle boarding requires the muscles in your feet to help you to stay on the board, so those muscles get a workout as you balance. Shoes get in the way of all that muscle building. 2. Some SUPers report better balance and more secure turning, claiming that bare feet can better feel the board and its movements. 3. For shifts in stance, such as paddler to surfer stance, or for tricks on the board, bare feet can mean greater confidence as bare feet are more connected to board movements. During a demonstration, instructors will often suggest bare feet. Ask before you arrive, but ultimately you should do what is comfortable for you. 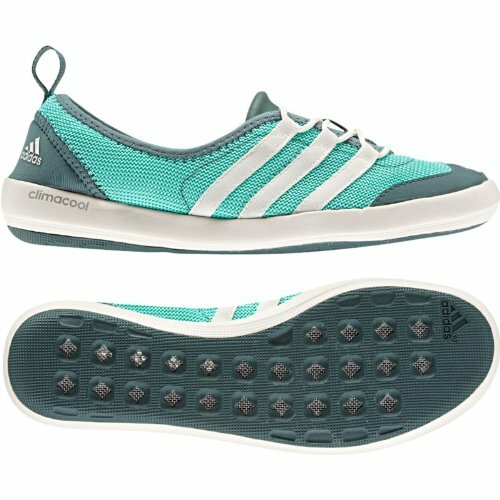 Let’s talk about kinds of water sport shoes for SUP. • Shoes should fit snug to minimize rubbing that could lead to hot spots and blisters, but comfortable. • Shoes should be designed for water, with good drainage and ventilation. Shoes that absorb and hold water will hinder your movements and feel uncomfortable. • It’s best to have some flex in the sole to allow quick shifting of your feet on the deck pad. There are many cuts and varying weights to choose from. Generally, they are 3 - 5 mm thick, with a low profile for cool weather or above the ankle style for cold conditions. Heel reinforcement is favourable to avoid blisters. Deck shoes are typically low profile and styled for warmer weather. The soles are non-slip and have holes for quick release of water. The uppers are made of varying materials, usually a mesh. 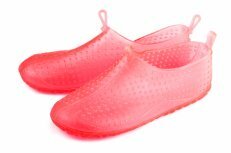 • the Vibram Five Finger brand makes water sports shoes that are ideal for SUP. They are non-restricting, with a glove-like fit and a sole with grip, making them feel close to bare feet. • water sandals work so long as they have a sole with some flex and sturdy straps, and a good grip on the deck pad. A secure fit is necessary for safety. 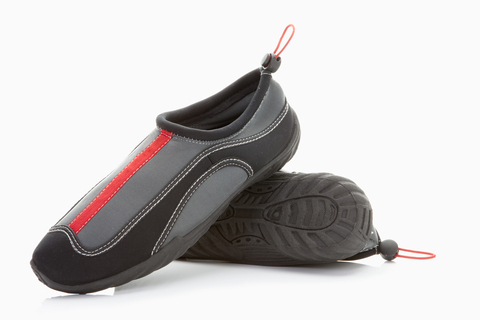 • slip-on water shoes or aqua socks must fit snugly, so your foot has little or no movement. A loose-fitting aqua sock could shift on your foot, making it hard to stand square on the board. Low profile neoprene shoes. Great for cool summer days.